New Sniper Elite 3 trailer has been released by Rebellion. Sniper Elite 3 is a latest addition to the Sniper Elite franchise. The game is a tactical third person shooter that allows the player to play with precision and keep the measurements of the environment while sniping enemies. Sniper Elite 3 is the third installment in the game’s franchise. Rebellion has released a new in-game footage of its upcoming next-gen tactical shooter game, Sniper Elite 3. 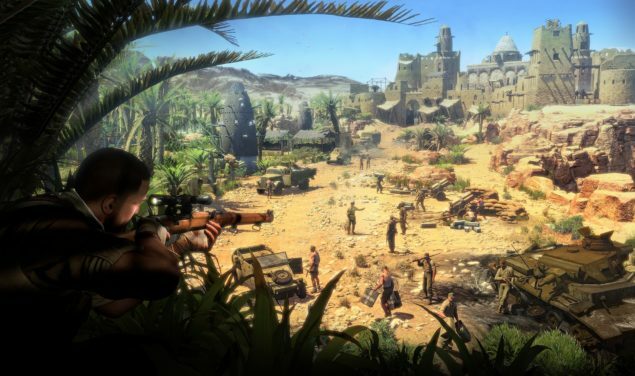 The trailer shows the next-gen visuals and environment of the game, the location shown in the Sniper Elite 3 trailer is of Tobruk, Libya. The trailer shows the new next-gen technology implementations done to the game. Some scenes in the trailer are from cutscenes of the game while the last bullet-to-the-eye X-ray kill cam shot was taken from the actual gameplay, the whole footage is shot in the game’s engine. Watch the buildings go down and desert fire up in the new Sniper Elite 3 trailer below. Sniper Elite 3 was announced earlier this year in March, it would be coming to both latest and current-gen consoles. The game is third installment in the Sniper Elite Series and the developer describes it as “more of a sandbox game”. The developer is focusing on next-gen quality and visuals while developing the game. The game would present scenarios that would allow the player to make meaningful choices and the gameplay would continue accordingly. According to the story synopsis, Sniper Elite 3 is set three years before the events of Sniper Elite V2 and features the series protagonist Karl Fairburne who is an expert sniper and OSS agent. Karl is sent to the ancient desert city of Tobruk, Libya in South Africa in the earlier years of World War 2 to hunt and kill enemies and then make disastrous escapes. Sniper Elite 3 would launch somewhere in 2014 on Microsoft Windows, PlayStation 4, PlayStation 4, Xbox One and Xbox 360.